A glimpse at the statistics gives the impression that Mississippi’s offense has been a dominant force this season. A deeper look shows that’s not necessarily the case. It’s true that Ole Miss is averaging nearly 37 points and 540 yards per game this season, which both rank among the best in the Southeastern Conference. But those numbers take a dive in conference games: The Rebels are scoring just 24.7 points per game against seven league foes. The biggest issue is that the Ole Miss offense bogs down once it gets into the red zone. The Rebels have scored just 13 touchdowns in 33 trips inside the 20-yard line in SEC play, settling for a league-high 15 field goals. The inability to score touchdowns instead of field goals is a huge reason why Ole Miss is in the midst of a four-game losing streak. 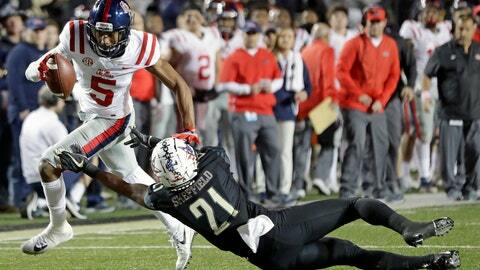 The Rebels have been competitive in all those games, including last weekend’s 36-29 loss in overtime to Vanderbilt . The loss to the Commodores was a perfect microcosm of the red-zone issues. Ole Miss scored just one touchdown in seven trips inside Vanderbilt’s 20-yard line, settling for five field goals. The Rebels gained 578 yards of total offense — including a career-high 457 yards passing from Jordan Ta’amu — and somehow scored less than 30 points in a game that included overtime. Ole Miss (5-6, 1-6 SEC) has one more chance to fix the red zone issues when it hosts No. 22 Mississippi State (7-4, 3-4) on Thursday in the Egg Bowl. It will be the last game of the Rebels’ season no matter what happens: The program is ineligible for postseason play for a second straight season because of NCAA sanctions. Luke has remained optimistic about the offense, even while acknowledging the Rebels aren’t capitalizing on having some of the league’s best playmakers, including Ta’amu and receiver A.J. Brown. Ta’amu is throwing for an SEC-best 348 yards per game. Brown has an SEC-best 1,259 yards receiving. Ole Miss will be trying to score more touchdowns against a Mississippi State defense that’s been among the best in the SEC and the country. The Bulldogs are giving up just 12.8 points per game and have allowed only 12 touchdowns all season, which is the fewest in the league by a wide margin. Even so, Mississippi State’s first-year coach Joe Moorhead is worried about the Rebels’ ability to make big plays.